Vista Apartments are in a fantastic location being a frontline development leading directly to Goodrington beach with no roads to cross. No. 8 is a very modern 2 bedroom apartment with 2 contemporary style bathrooms and its own entrance accessed via its private terrace. It has stunning views of Goodrington Sands and across the bay to Brixham and Berryhead. 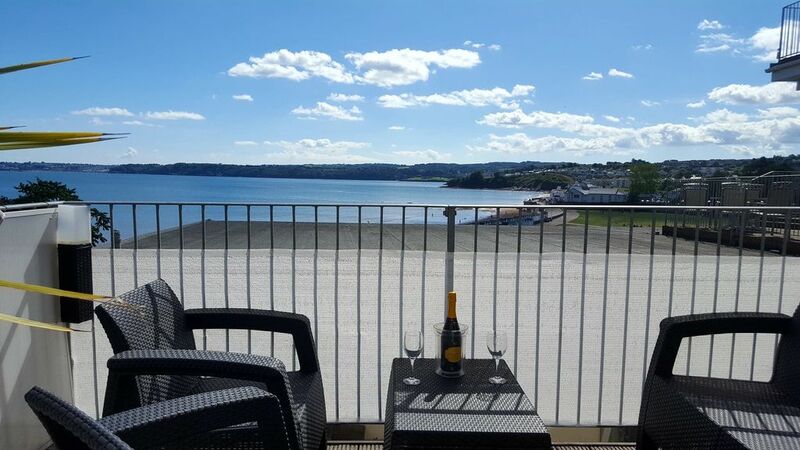 Goodrington Sands offers a variety of watersports, boat hire, deckchair hire and a pub with gardens overlooking the beach (food served all day), it also offers a separate grill in the gardens in the summer. This is also where you will find Quaywest Waterpark, Go Karts and Quad bikes. Youngs Park with boating lake, bandstand, childrens play area and the licenced Rock Cafe are adjacent to the apartment, where live music is held regularly during the summer months. In the other direction, 2 minute walk away, are Roundham Gardens with stunning views across to Torquay. There is also the Paignton to Dartmouth steam railway running along the coast which can be joined at Goodrington station. The coastal path offers fantastic walks around the bay, to Torquay in one direction and to Brixham and Berryhead in the other. Large sofa seating 4, leather armchair, flatscreen TV, DVD/HDD recorder/player, stereo/CD/radio, coffee table, lamp table, dining table and chairs seating 6, standard lamp. Large window with views of beach and sea, door to terrace with views of the same. Kitchen area with island housing stainless steel sink. Electric eye level oven/grill, gas hob and extractor, microwave, fridge with freezer compartment, dishwasher, cupboard housing washing machine and additional freezer. Sea views. King size bed, 2 bedside drawer units, 2 wall lights, large wardrobe incorporating drawer units, vanity shelf with mirror over and chair, flatscreen TV/DVD player. Sea views. Contemporary style with WC, sink, bath and separate shower cubicle with electric shower, heated towel rail. 2 x 3ft beds, 2 drawer bedside unit, table lamp, large built in wardrobe, 6 drawer chest of drawers, large full length mirror. Contemporary style with corner shower cubicle with electric shower, WC and glass washbasin, heated towel rail. Decked terrace with patio table and 4 chairs, outside light. One private parking space and on street unrestricted parking. Free internet access ,fast enough for gaming . All bathroom towels provided,but not beach towels. Living area with spectacular views of the bay , three seater settee ,armchair ,coffee table ,television ,dvd player,sony music centre. Will seat up to 6 people, with view of the bay . Sony stereo system with cd player . decking with views of beach and sea ,there is a patio table and 4 chairs on the terrace . The property was part of, we were told by other residents, previously an old hotel. It was very well equipped in a splendid location overlooking the sea.There was only 2 of us and we found the space very adequate although some might consider the lounge area modest for 4 adults. There is a very pleasant patio, with comfortable furniture, overlooking the sea that would have been nice to use except unfortunately the weather was too chilly during our stay. Others have commented on the access to the car park. However we had no trouble with a Ford Mondeo and local tradesmen negotiated the access with bigger vehicles. Parking on the road was usually available. The owner provided an excellent welcome pack. All in all a most pleasant and enjoyable holiday. High quality apartment well maintained with a view over the bay. This is a very well equipped apartment, we stayed over new year and the balcony allowed great views over the bay and towards Brixham to watch the fireworks at midnight, also great views of the nearby beautifully lit Christmas steam train. All facilities in the apartment are great, well equipped kitchen as part of the living / dining area, and the dining table is under a conservatory roof giving lots of welcome daylight. The welcome pack of bread, milk, butter and bubbly was very well received, thank you! Allocated parking space is a bonus although we left ours on the road which has lots of room for parking. An easy walk to Paignton town seafront with a lovely pier, seafront cinema, vibrant main street leading up to the railway station for regular services and the steam train to Kingswear / Dartmouth. We had a great stay and would highly recommend. Really glad you both enjoyed your stay , thanks for the great review it was a pleasure having you both stay . Hope you come back and stay again some time . Thoughtful welcoming touches by the owners very much appreciated and set the tone for a pleasant stay. Apartment offered all we had wished for, superb views, ideal location and interior design/decoration. Driveway to car park bit tricky, with tight corner at top end and big dipper ride down to numbered parking bay. OK (even fun) if you are a confident driver, otherwise plenty of parking on road outside. Broadband speed (measured at 10mbs) good enough if you want to watch Sky Go while away from home and if you take a HDMI cable with you the lounge TV has a spare HDMI 2 connection, giving a good picture through the TV. Nearest part of Goodrington beach (washed by tide) allows dogs all year round and is a bit of a mecca for dog owners, 200 metres further on the dryer 2nd part of beach no dogs are allowed.Dog owners very well behaved and good at cleaning up, no signs of fouling around the area. Good area for walking, either as 'strollers' like us now or for more of a challenge the South West coastal footpath is on your doorstep. Would loved to try walking from Brixham back to apartment when I was fitter. If you like steam trains you will love the sights from the apartment of the Paignton to Dartmouth train and its evocative steam whistle as it passes through Goodrington station. Would I stay again? Very much so. Great location. Great apartment and the hosts are very helpful. Will def go again. We arrived finding a cosy and stylish flat overlooking the sea and Goodrington gardens. we were surprised finding a Kind "welcome basket" with useful Content as well as the fridge which was filled with milk, orange jus and bread. thank you! Rooms very clean, good beds, absolutely nice bathrooms and well fitted kitchen. We felt at home from the first Moment on. Of course we can highly recommend the place as an ideal Holiday flat for a couple or a Family! I am so pleased you enjoyed your stay and everything was to your satisfaction You were great guests and you are most welcome back at anytime . It is my aim to make your stay as nice as possible .